Gourmet Gift Baskets is offering guaranteed Christmas delivery. Even better, any order placed today can be delivered as early as TOMORROW. The Gourmet Meat and Cheese Basket is the perfect gift for families, fathers, colleagues, neighbors or business associates! Pop open your favorite bottle of wine, and lay out all of the delicious food that we’ve gathered in this meat and cheese basket! It’s perfect for any social event, or to enjoy in the comfort of your own home. Pair a Pinot Noir with our savory garlic cheddar, or maybe a sweet Riesling with our top-quality summer sausage. No matter what kind of wine is being served, our Meat & Cheese Sampler has something that will pair perfectly with it. Christmas is just a few days away, and Gourmet Gift Baskets will help you get a last-minute gift to where it needs to go! Order today and delivery will happen before Christmas! 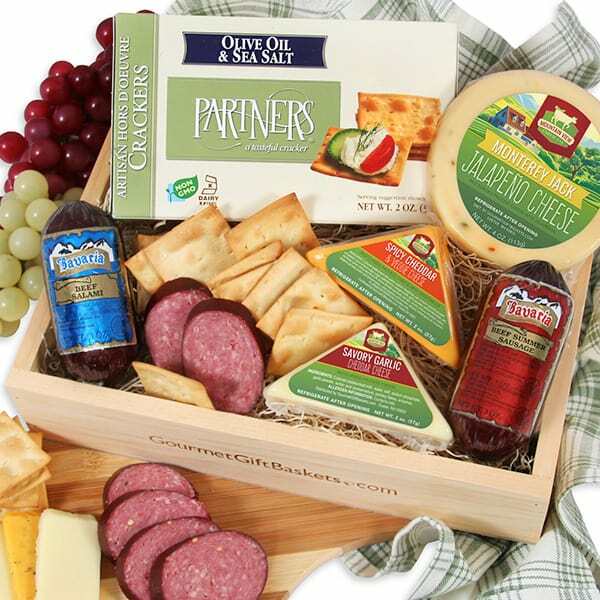 Shop for the Gourmet Meat and Cheese Basket now!